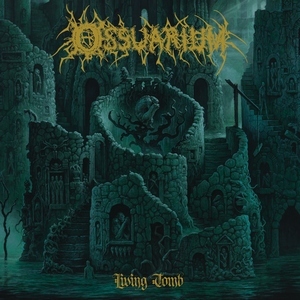 Having begun to generate some attention with a 2017 demo and a split last year with Draghkar, Portland’s Ossuarium are set to release their first full-length, Living Tomb, with the backing of extreme metal label 20 Buck Spin. In unearthing their particular brand of death/doom metal, what seems to be most important is that they don’t copy too much of the template from their inspirations. Despite a murky and cavernous feel to the material, Ossuarium strikes a solid line between being influenced by other music as opposed to imitating it. So thankfully, while they do drive between death metal bashings and more doomy lumbering, one doesn’t immediately go for the Incantation card (a pleasant surprise within the last few years). The way the guitar riffs feel when they go all in on the doom side is massive. Absolutely stomping riffs that tend to vibrate along your person as each one hits (see “Blaze of Bodies”), giving the band a power that others often attempt but usually fall short on. Even as a debut album, they are also wise enough to switch up the formula as they go. Some tracks lean harder into either death or doom, and others juggle in more melodic and atmospheric tendencies or instead drive straight to the point. Each component is done equally well at that, with invigorating speed runs nailing the adrenaline and eventually tapering into thunderous crawls. Lastly, just because the music is dreary doesn’t mean it has to sound like it was recorded in the early ‘90s, and Living Tomb packs a meaty punch. Hard to make much in the way of complaints with Living Tomb. While the rules of the genre are pretty well followed, the attempts to keep the formula fresh and varied alongside the lack of blatant influences on sleeves make Ossuarium a name worth getting behind.